June is a happy month. At least that's how I see it. Graduations, weddings, vacations, Father's Day, starting of summer. Well, that "happy" month is here. I hope this will be a happy month for sharing here on Spiritual Sundays. Links were down last week. I'm sure the Memorial Day weekend was responsible. Thank you again to everyone who participates in any way. 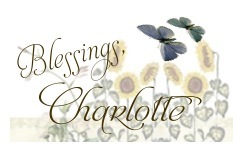 Charlotte, you're right June is a happy month, so full of special events, sunshine, flowers ... hope yours is off to a beautiful start. Thanks for hosting!